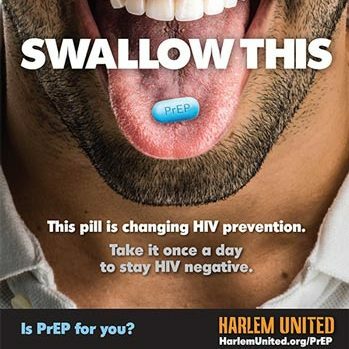 A little over a year ago, Harlem United launched Swallow This, our innovative campaign to educate New Yorkers about PrEP. PrEP is a daily pill that’s highly effective at preventing HIV infection. Over the past year, we’ve had a blast teaching people about PrEP, hearing your stories, and getting to know our community even better. In 2015, millions of people saw our ads online and in bars, bus stops, and bodegas throughout New York City. We inspired hundreds of people to talk to their doctors about PrEP, discuss PrEP with their partners, and even make appointments with Harlem United medical providers to get started on PrEP. Our ads reached a huge number of people with important information about PrEP. 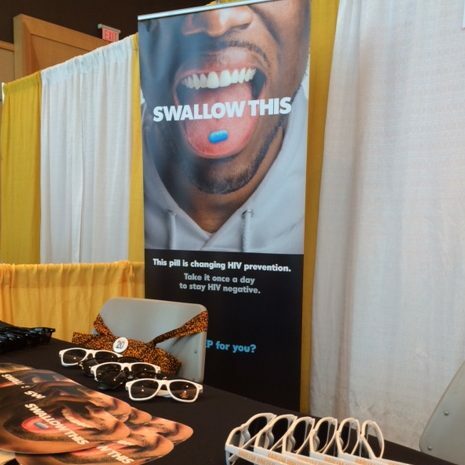 In 2015, Swallow This print ads received over 78 million impressions. Digital outreach produced over 13 million impressions and nearly 108,000 ad clicks. 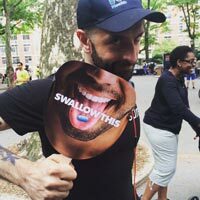 We brought Swallow This to New York City Pride, where tens of thousands of people learned about our campaign and had the opportunity to ask our experts about PrEP. 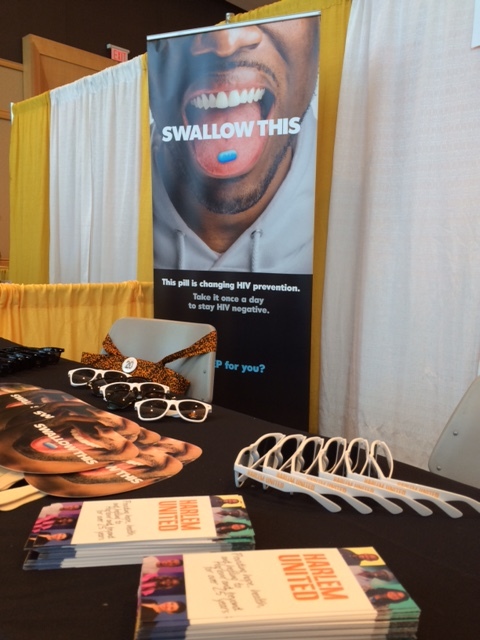 We had the opportunity to present the Swallow This campaign at conferences all over the United States and work with other AIDS experts to share the message of PrEP education; this photo was taken at the United States Conference on AIDS in Hollywood, Florida. Our campaign was such a hit that LGBT organizers in Miami, Florida reached out to us to ask about adapting the campaign for their community. In November 2015, “Swallow This: Miami” was born. Th e Swallow This campaign is more than just an ad — it’s making an impact. After the first year of the campaign, we surveyed New Yorkers and found that as a result of seeing the campaign, most were more likely to take actions around PrEP, including talking to a doctor or a partner about PrEP. First off, we’re bringing our Swallow This campaign back for another year, and we’re going to reach more people than ever. In addition to educating men about PrEP use, we’re extending our message to better reach women, including cisgender women and transgender women, who face a higher risk of contracting HIV than many other communities. Want to be part of Swallow This? Harlem United is looking for volunteers to participate in an upcoming video project about using PrEP. We are looking for individuals who are comfortable speaking about their experience either as a PrEP user, a potential PrEP user, or someone involved in PrEP advocacy in a professional capacity. You must be available to participate in filming in New York City the week of October 24 and it will involve a few hours of your time. Email harlemunitedcasting@def6.com with your name, contact info, and a recent photo if you’re interested! Next, we’ll be rolling out new materials to show you what PrEP is all about, from more of our nationally recognized posters to informational videos about why PrEP can make a difference for you. 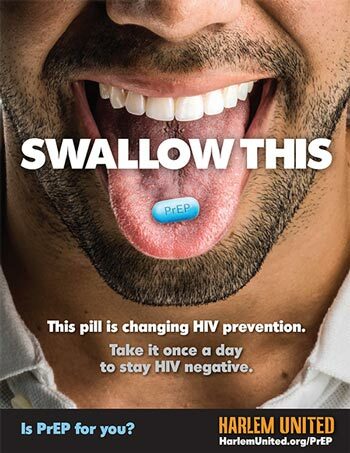 We’re also excited to be collaborating with other groups to bring the message of Swallow This to even more people across the country, including in Key West, Florida, and we hope to find other ways to connect with groups nationwide about PrEP education. Finally, we want to hear from you about how we can make Swallow This even better! What do you want to see in the campaign? What do you want to know about PrEP? Tweet us @harlemunited and let us know! 2 Replies to "Swallow This — Again: Our PrEP Campaign Is Back!"